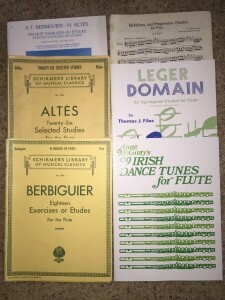 Etudes, or study pieces, are the third element of a productive practice session. If you haven’t read the blog posts OVERVIEW, WARM UP, and SCALES, you may want to start with those before reading about part #3. Our bodies and minds are warmed up and our fingers have worked on some fast, but short, technical exercises or scales. If our practice session is 30 minutes in length, you will want to spend about 6 minutes on etudes. If you’re watching the clock, the third part will be minutes 7-13. Remember, these are ballpark numbers and you may need to adjust your practice session if you need more work in one area than another. By the way, the word etude comes from the French word “to study.” I think it is a lovely, elegant word. Continuing the drawer analogy I have used in the other posts, the third drawer (orange in the picture) is slightly larger than the second drawer. In this drawer we find study pieces. These etudes are longer than the two or three line exercises we worked on in the scale section. Depending on your level, the etudes could be anywhere from a half page to four pages in length. Etudes are different from repertoire pieces because they are learned in a shorter time frame, usually 1-4 weeks. These pieces are played at lessons but rarely in a performance. Etudes are often included in volumes with a variety of key signatures. Many etudes are written with a specific technical goal in mind, such as octave practice or double tonguing. Repertoire pieces, on the other hand, are long term projects and are often performed in recitals or contests. We’ll discuss repertoire pieces in the next part of our practice. Etudes bridge the work between scales and repertoire. Can I be honest with you? I hated etudes when I was in college. They felt like drudgery. I wanted to skip to the repertoire pieces that I loved. But old age brings wisdom and I now know that practicing etudes helps with the repertoire work. Etudes can be entertaining too! 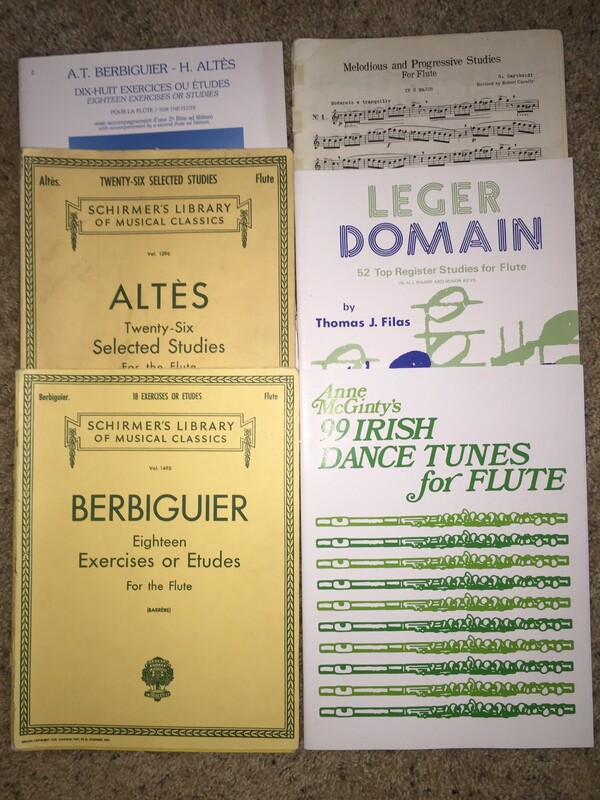 My younger flute students like using Irish music for their etudes. They are pleasant for everyone to listen to and because Irish music is very tonal, students can immediately know if there is a wrong note. An added bonus is that Irish tunes are a blast at fast speeds, providing motivation for working with the metronome. Every instrument has standard etudes. For flutists, it’s Anderson, Altes, and Berbiguier. Please leave a note in the comment section below with the best-loved (or hated!) etudes for your instrument. And now, you’re ready for the largest chunk of time: REPERTOIRE.